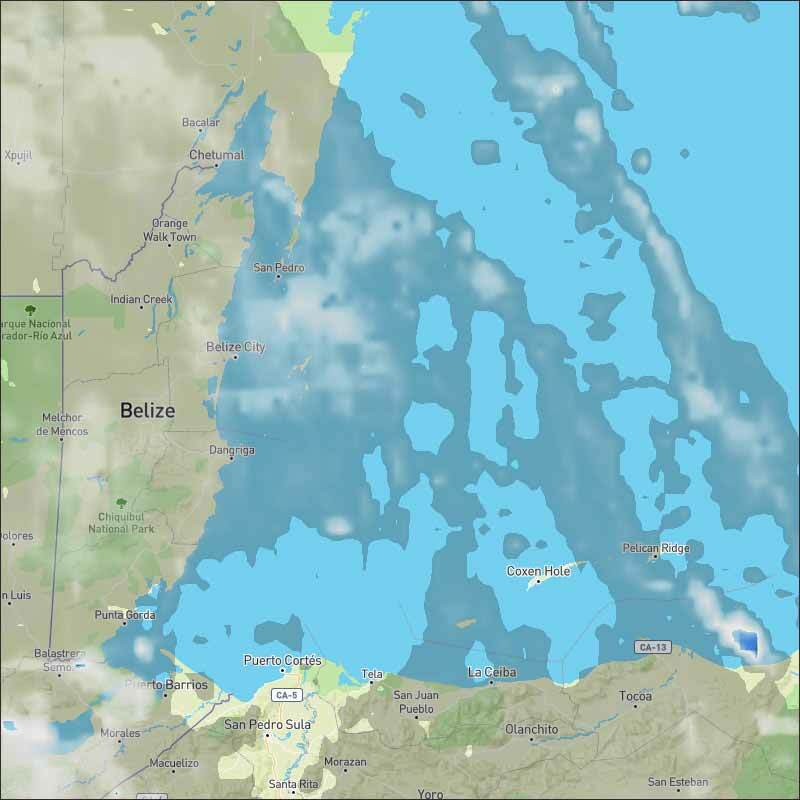 Belize NMS: A slight increase in moisture is expected over the area tonight. 24-hour forecast: Sunny with cloudy spells today along with isolated showers. Cloudy at times tonight with a few showers or thunderstorms mainly in the south at first, then spreading northward by daybreak. General Outlook: A few showers or thunderstorms will occur mainly over central and northern areas on Monday, decreasing on Monday night and affecting mainly the south. Today E-NE 5-15 kts Light Chop-Choppy 1-3 ft SUNNY WITH CLOUDY SPELLS ALONG WITH ISOLATED SHOWERS. Tonight E 10-20 kts Choppy-Moderate 3-5 ft CLOUDY AT TIMES WITH A FEW SHOWERS OR THUNDERSTORMS SOUTH AT FIRST THEN SPREADING NORTHWARD. Tomorrow E 10-20 kts Choppy-Moderate 3-5 ft A FEW SHOWERS OR THUNDERSTORMS MAINLY CENTRAL AND NORTH. Outlook E 10-20 kts Choppy-Moderate 3-5 ft PARTLY CLOUDY WITH ISOLATED SHOWERS; FEW MORE OVER THE SOUTH. 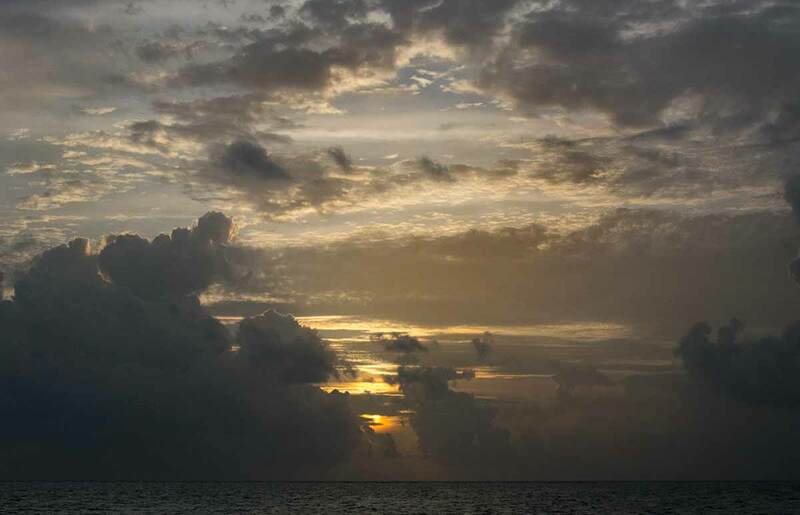 A Gale Warning is in effect for the south-central Caribbean. Refer to the section above for details. An upper-level low is centered near 18N75W. This feature is enhancing convection across the northwest Caribbean waters mainly north of 20W and west of 74W. A tropical wave extends its axis along 66W. For more information, refer to the section above. The monsoon trough extends along 10N between 76W-82W. 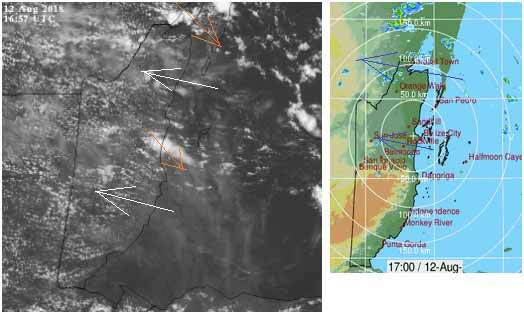 Scattered showers are noted across Panama and Costa Rica due to this. Little change is expected through early next week. The next tropical wave will enter the eastern Caribbean by late Monday. On Ambergris Caye this morning the wind is from the East at 10 mph and the sea around our barrier reef is calm. Today's expected high is 88 f.
There is a scheduled power cut effecting Belmopan and most of the Western Highway, due to be reconnected around 2pm. Presently I am using a low cost semi-square wave Inverter. My good inverter failed at Christmas. 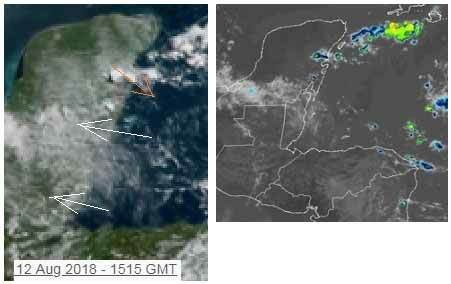 There is significant easterly Caribbean clouds at present, some a little chunky, which could cause the odd rain shower later, presently there is a little rain out at sea and more up in the Yucatan. Looks like today will be sun and cloud, with only a low chance of some rain. The Cloud and rain picture. There is high level air from the NW now causing some clashing and causing some rain.